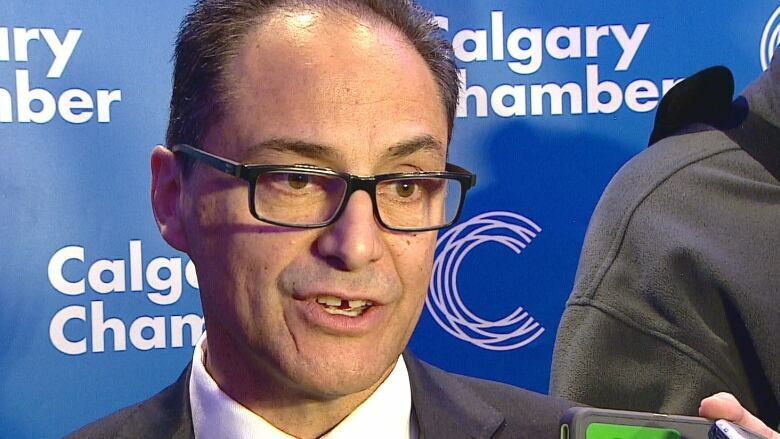 Finance Minister Joe Ceci drew applause from Calgary's business community when he emphasized the lack of sales tax in his government's most recent budget, but the same audience also wondered how long Alberta can continue without one. Ceci addressed the the Calgary Chamber of Commerce during a breakfast event at the Hyatt Regency Hotel on Monday morning, going over the budget's key points — including how it maintains "Alberta's tax advantage with no payroll tax, no health-care premiums and no provincial sales tax." But later on, in a Q-and-A session with the minister, numerous questions submitted from the crowd focused on how the government will address the lingering gap between Alberta's revenues and expenses if oil prices don't rebound significantly. "I've got a pile of questions around some notional sales tax," Chamber president Adam Legge told the minister. "Oh, look, the time's up," Ceci joked, before going on to say the NDP campaigned on policies other than a sales tax and that would remain the government's focus — for now, at least. "We're looking for efficiencies. We're working to be a shock absorber. We're stimulating the economy," he said. "If Albertans have a different view, generally, on where we should be going for revenue, then let's hear it. But we're doing what we said we would do." The idea of a sales tax is seen as highly unpopular in Alberta, and Legge said he recognized it's an "uncomfortable" discussion for a politician, but continued to press Ceci how Alberta would close its yawning $10.4-billion budget deficit. That seems a particular challenging, Legge noted, if Alberta indeed finds itself in "a new world for energy prices" in which oil stays relatively low for years. "If we don't see prices getting much more than mid-$60s ... under that kind of a scenario, there's still a gap," Legge said. Ceci acknowledged the challenge but reiterated his government's plan to curb spending growth, diversify the economy and slowly move toward a balanced budget in 2024. "We're not in the $105-a-barrel world any more," Ceci said. "And previous governments couldn't balance the budget on $105."